Find out how you could have free ongoing access to AffirmX’s complaint management solution. 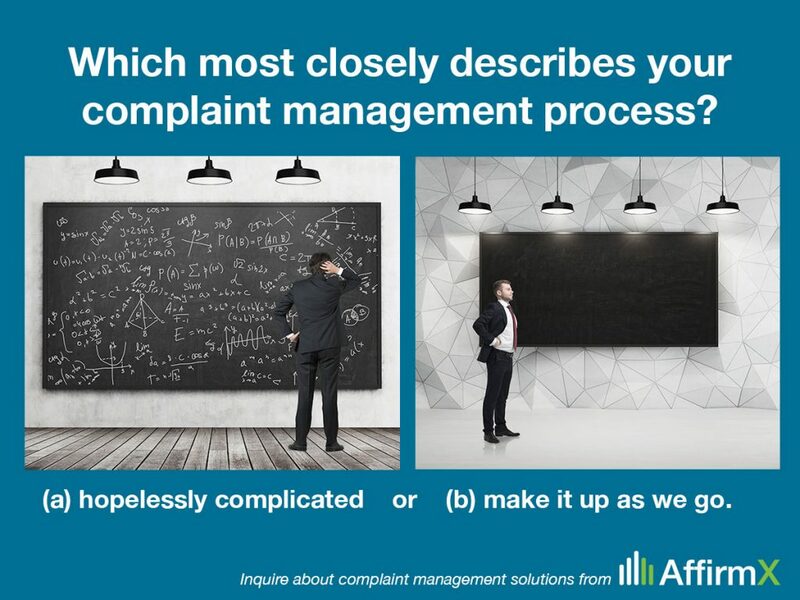 Would you describe the complaint management solution at your financial institution as (a) hopelessly complicated, or (b) something you make up as you go? We hear from more and more financial institutions that examiners are looking at how they’re set up to handle and document consumer complaints. AffirmX has a solution that will help you not only handle the complaint from receipt to resolution, but provide you with documentation of each step along the way. What’s more, for a limited time, AffirmX is offering ongoing usage of the AffirmX Complaint Management Solution at no charge. Simply schedule a 30-minute call with your league representative or one of AffirmX’s client liaisons to share with us what compliance or other risk areas are pain points for you. Then let us see if we have any solutions we can offer to help those pain points go away in a cost-effective way (it’s what we do!). Contact your league/association representative for more information, or complete the form below. Questions? Contact AffirmX us at 888.972.3624 or info@affirmx.com. *AffirmX’s Complaint Management Solution is available free to financial institutions only.